This is America's second oldest light station, after Boston Light (1716), and an astounding total of nine different lighthouse structures have stood here over the years, not including a bonfire on a hogshead (barrel) that was said to be in use as early as 1700. By the 1740s, Nantucket's whaling industry was growing fast. At a town meeting in January 1746, the merchants and mariners of Sherburne, as the town was then called, voted to erect a lighthouse at Brant Point to mark the point around which all vessels passed as they entered the island's inner harbor. The sum of 200 English pounds was appropriated for the lighthouse, and three men were assigned the duty of building the structure. The keeping of the light in the first lighthouse was left to the ship owners. No detailed description survives of the wooden 1746 lighthouse, which burned down in 1757 -- probably the result of an oil fire. The second light, also made of wood, was destroyed in a storm in March 1774, which was described in a newspaper as the "most violent gust of wind that perhaps was ever known there." The storm, probably a tornado, also destroyed many buildings on the island. A third Brant Point Light was paid for by a tax on shipping coming into the area. All vessels of 15 tons or more were charged six shillings at the time of their first coming or going each year. In September 1781, a band of Loyalist privateers entered Nantucket Harbor. American forces from Cape Cod came to Nantucket and set up cannons at Brant Point. They fired on the Loyalist vessels and managed to force them out of the harbor. In 1783 the lighthouse burned down again. A new light was erected, no more than a lantern hoisted up between two spars. This structure burned down in 1786. The fifth lighthouse lasted only two years before it was destroyed by a storm. The next lighthouse, built by the Commonwealth of Massachusetts in 1788, was ceded to the federal government in 1795, the same year the town changed its name from Sherburne to Nantucket. The light was extinguished during the War of 1812. By the 1820s, over 200 Nantucket whaling ships were in service and a new, more efficient lighthouse was called for. A new Brant Point Light was built in 1825 at a cost of $1,600. The tower was situated on top of the keeper's house. The lighting apparatus consisted of eight lamps and reflectors. An 1838 inspection by Lt. Edward W. Carpender of the U.S. Navy reported, "I found the lantern smoked, tube-glasses the same, lamps not trimmed, and reflectors looking as if weeks or months had elapsed since they had been cleaned, they were so black and spotted." An 1843 inspection by I.W.P. 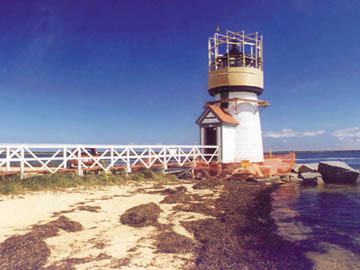 Lewis showed Brant Point Light to be in very poor condition. "In case of a high flood tide," said Lewis, "the whole structure might be swept away." The cellar, where oil was stored, was often flooded. The tower was also reported to be leaky, and the lantern had become very rusty. The keeper was given no boat, and complained that "In case of necessity, I have no means of saving my family, should a storm destroy the house"
In 1856, the station was rebuilt at a cost of $15,000, this time a 47-foot brick tower was built along with a new brick keeper's house. The tower received a fourth-order Fresnel lens showing a fixed red light. This lighthouse still stands, west of the present Brant Point Light, minus its lantern room. It is part of U.S. Coast Guard Station Brant Point. 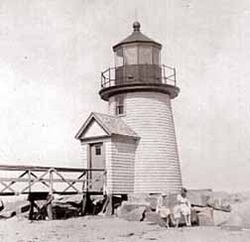 In the 1800s, several other navigational lights were erected near Brant Point. A light known as the Nantucket Beacon for a time served as a range light with Brant Point Light. The lights would be lined up as mariners entered the harbor. Another pair of range lights was established on skeletal towers in 1908; these lights are still in use. Two other lights, the Cliff Range Beacons, were established near Brant Point in 1838, along with a keeper's dwelling. Peleg Easton was made keeper of the Range Beacons at $300 per year. These lights, popularly known as the Bug Lights, were later rebuilt and remained in service until 1912. They were sold to a private party and moved near Bathing Beach Road, where they still stand. Click here for an article about the Cliff Range Beacons, also known as Bug Lights, by Frank Gilbreth, Jr.
Left: A keeper on the lantern deck of the 1856 tower. New York Public Library. Because of shifts in the channel, the 1856 lighthouse was discontinued in 1900. It was replaced for a short time by a fixed red light on a pole. The present Brant Point Light was built 596 feet east of the previous one in 1901 and fitted with a fifth order Fresnel lens. The lighthouse originally had a 1,000 pound fog bell. An oil house was added in 1904. There was eventually an assistant keeper assigned to the station to help with the extra duties of tending the fog bell and the Brant Point Beacon. A small assistant keeper's house was added. Gerald M. Reed, formerly at the Plymouth Light Station, arrived as keeper in December 1926. Reed came with his family aboard a lighthouse tender on Christmas Eve. Because it would have been dangerous to unload the family and belongings by rowboat in the dark, the Reeds spent Christmas Eve on board the ship and came ashore on Christmas morning, 1926. Soon after it was built, the new Brant Point Light was threatened by the sea, so 500 tons of riprap were placed around the beach. The white light at Brant Point was changed to red in 1933 to avoid confusion with nearby house lights. The light was automated in 1965. Brant Point Lighthouse and fog bell tower in the early 1900s. Courtesy of Dolly Bicknell. In 1983, the entire Brant Point Station complex was renovated by the Coast Guard. Right: Keeper Gerald M. Reed (L) and Asst. Keeper Frank W. Craig in August, 1932. In the fall of 2000, the Coast Guard and Campbell Construction Group completed an overhaul of the lighthouse. The design work for the renovation was done by Marsha Levy from Civil Engineering Unit Providence, Rhode Island. The six-week project entailed removing the lead paint from the lantern and replacing all the lantern glass, reshingling the tower, repainting the entire structure, and replacing the interior stucco work. Brant Point Light's occulting red light is 26 feet above sea level, making it one of the lowest of New England's lights. It is seen by thousands of people each year as they enter and leave Nantucket on ferries from the mainland. The long tradition of arriving at Nantucket by "coming 'round Brant Point" appears destined to continue well into the future. Video (2009): Nantucket Coast Guard crew makes a holiday wreath for Brant Point Lighthouse. David Coffin (?-1831); David Coffin 2nd (1831- ? ); James Allen (c. 1850); W. H. Swain (c. 1867); F. B. Smith (c. 1882); John Chapman (1898-1907); Everett Joy (1907-1911); Richard F. Dixon (1911-1926); Carl Delano Hill (c. 1920-1921); Gerald M. Reed (1926-1941); Frank W. Craig (asst., c. 1932).